Aspergillosis is actually the name of a group of conditions caused by a fungal mold called aspergillus which typically affects the windpipe, sinuses and lungs but can spread to other tissues in the body (4). These conditions typically cause asthma-like symptoms such as wheezing, shortness of breath, cough and fever but can also mimic sinutitis and lung infections. More severe symptoms include weight loss, chest pain and coughing up blood (5). The condition is not contagious and healthy individuals can usually fight off the infection before it spreads to the lungs. Once it reaches the lungs, the condition is typically treated with antifungal medication. Craig Mather, a 43-year-old father of three from Bolton, suffered serious mold-related lung infection from frequently drying wet clothes on his bedroom radiator. Mather had been asthmatic since childhood and had contracted tuberculosis in 1997, both of which left his lungs weakened and vulnerable. 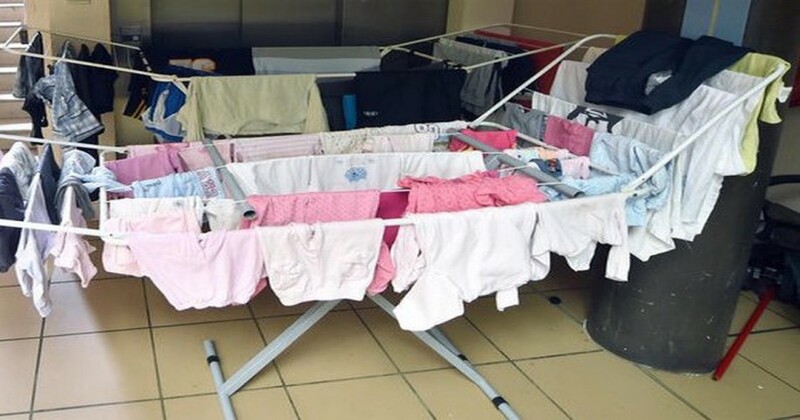 “My advice would be when in doubt dry wet washing outside, in a tumble dryer or in a well-ventilated indoor space away from bedrooms and living areas to be safe rather than sorry,” suggests Professor Denning. If the weather is mild enough, keep your windows open to give the humidity a place to go or use a dehumidifier to wick away moisture from the air inside your home. It’s also a good idea to open windows after cooking or taking a shower to limit moisture in your home, which can also cause mold to grow on your walls, tiles and ceilings (6).